Nine ways of resting the mind (Tib. སེམས་གནས་པའི་ཐབས་དགུ་, sem nepé tab gu; Wyl. sems gnas pa’i thabs dgu) — whatever the object of our meditation, we pass through nine stages in the development of shamatha. The ninth stage of resting the mind is also known as the ‘one-pointed mind of the desire realm’ (Tib. འདོད་སེམས་རྩེ་གཅིག་པ་, Wyl. ‘dod sems rtse gcig pa). These are taken from Maitreya's Ornament of Mahayana Sutras (Skt. Mahayanasutralankara). Complete familiarity (Skt. abhyasabala; Tib. ཡོངས་སུ་འདྲིས་པ་, yongsu dripa; Wyl. yongs su ‘dris pa) – the final stage of ‘resting in equanimity’ where the mind is unaffected by the obstacles of dullness or agitation is accomplished through complete familiarity. 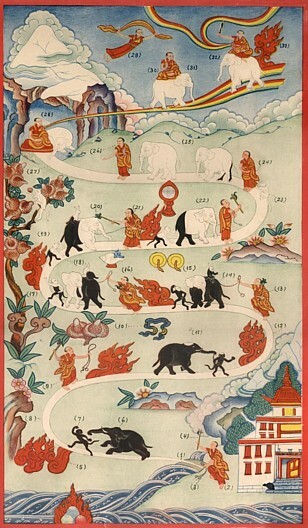 ↑ On a large scale, this picture depicts the complete process or path of shamatha. On a smaller scale, it illustrates the process we go through in almost every meditation session. Dzogchen Ponlop, Wild Awakening (Boston & London: Shambhala, 2003), pages 100-109. Khenchen Thrangu Rinpoche, The Practice of Tranquility and Insight—A Guide to Tibetan Buddhist Meditation (Ithaca: Snow Lion Publications, 1993), pages 46-55. Sogyal Rinpoche, A Treasury of Dharma (Lodeve: Rigpa, 2005), pages 206-225. This page was last edited on 16 February 2012, at 03:32.